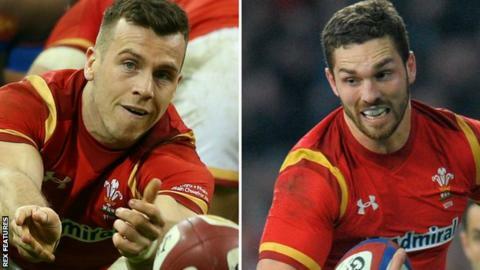 Wales scrum-half Gareth Davies and wing George North are among 12 players shortlisted for the Six Nations 2016 player of the tournament award. Centre Jamie Roberts has not been included by the panel, on which former Wales captain Gareth Thomas sits. Three of England's Grand Slam winners, Jonathan Joseph, Jack Nowell and Billy Vunipola, are shortlisted, but not locks George Kruis or Maro Itoje. Two players were nominated from France, Ireland and Scotland, plus one Italian. Ireland's Jonathan Sexton and Conor Murray are joined by Scotland's Stuart Hogg and Duncan Taylor, while France's Guilhem Guirado and Virimi Vakatawa were recognised, along with Italy captain Sergio Parisse. Roberts' exclusion comes despite a campaign that drew widespread praise for his displays, including a man-of-the-match performance against Scotland. Davies, who spent most of the tournament as Wales' first-choice number nine, was replaced in the starting line-up by Rhys Webb for the final match against Italy and scored a try after coming on as a 62nd-minute replacement. Northampton Saints' North, who previously suffered four head blows in a five-month spell and was sidelined for much of 2015, was the only player in the championship to score more than three tries. England's Owen Farrell finished the tournament as the top points scorer, contributing 62 points over five games.